A super agency. A radical change. The will of the people. A citizens commission proposed by a group seeking a new redistricting system in Michigan was called a lot of things Wednesday morning, when advocates for and against the initiative spoke for more than an hour before the state Supreme Court. But there’s only one moniker that matters to the justices: whether the proposed ballot measure is an amendment or a general revision to the Michigan Constitution. The hearing’s outcome is likely the final step in a contentious legal battle over the constitutionality of an initiative to change the way Michigan draws voting district lines. The proposed ballot measure would take that power away from the legislature and give it to an independent board of 13 citizens in the hopes of avoiding partisan gerrymandering by whichever political party is in power. The Court’s seven justices did not indicate when they will rule on whether the measure will appear on November’s ballot. At issue is whether the Voters Not Politicians’ proposal — which is eight pages long and would add thousands of words to the state constitution — is a simple amendment that can be made through a ballot initiative process, or a general revision to the constitution, which requires a constitutional convention. 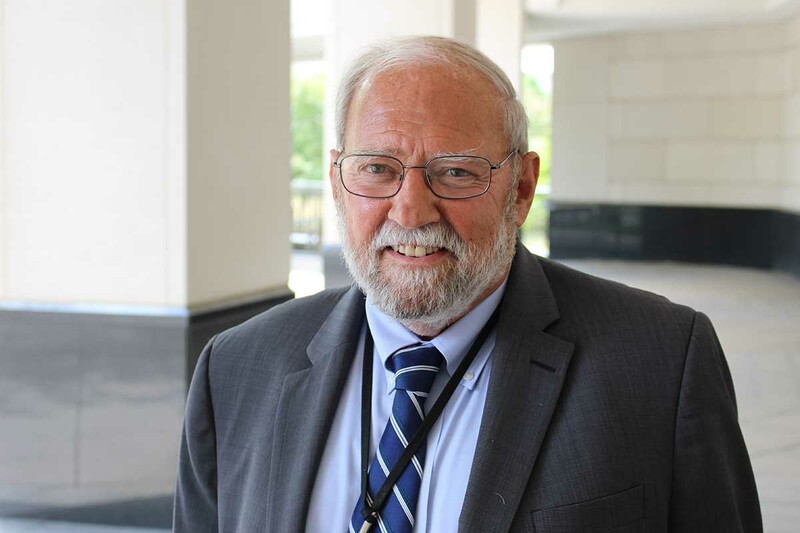 Citizens Protecting Michigan’s Constitution, the opposition group represented by attorney Peter Ellsworth, argues that it is a sweeping change to all three branches of government and that there is judicial precedent that would allow the Court to rule against VNP. Solicitor General Aaron Lindstrom also spoke on behalf of Attorney General Bill Schuette (who is currently running for governor) in opposition to VNP. 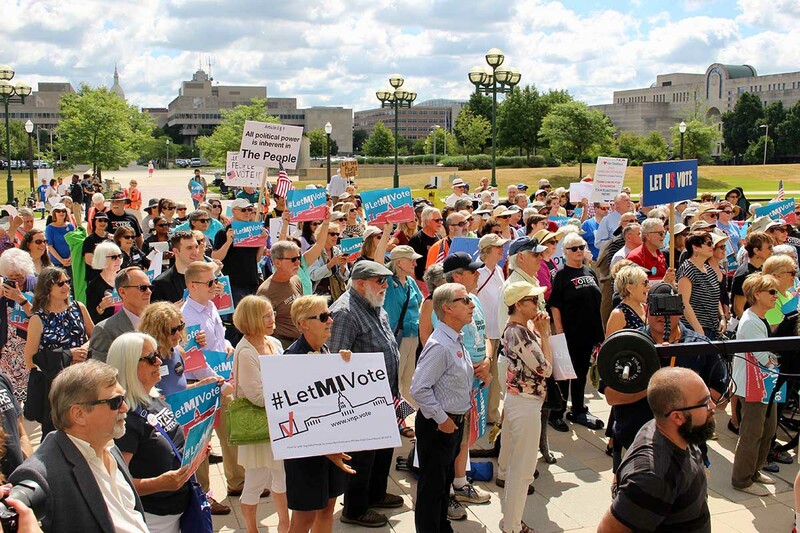 Graham Crabtree, the attorney representing Voters Not Politicians, argued that the initiative is merely an amendment to the constitution because it addresses a single subject: how Michigan chooses to draw legislative boundaries. He added that the court should liberally interpret laws when it comes to the people’s right to vote. A representative from the Secretary of State’s office urged the Court to issue a decision by early August so that the agency can have time to craft ballot language before the final ballot is certified for November. 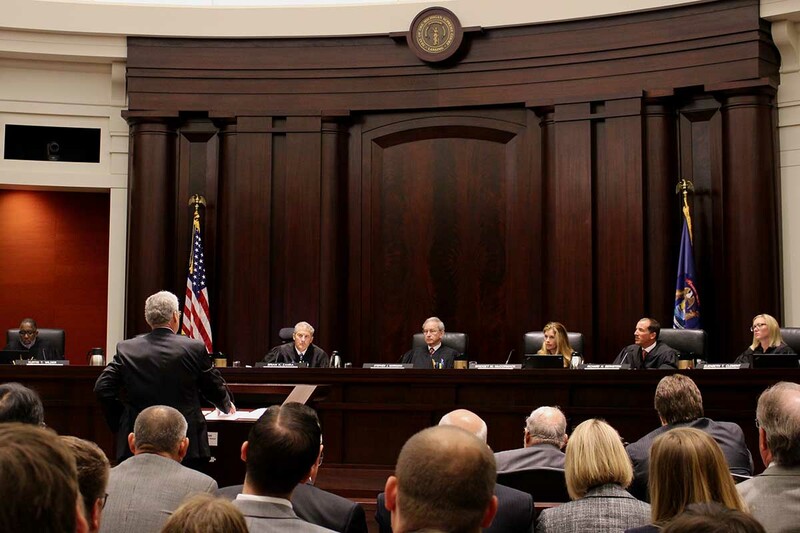 The Court must decide the case before September 7, when the Secretary of State has to have all constitutional amendment wording finalized for printing on the fall ballot. Michigan is one of a handful of states where political parties nominate candidates for the Supreme Court. The High Court currently has five Republican justices and two Democratic ones. The two Democratic justices raised questions Wednesday that appeared to favor the initiative, asking whether voting to strike down the VNP ballot measure would create a precedent for the Court to exert undue power over the ballot initiative process. Voters Not Politicians’ volunteer petitioners gathered more than 425,000 signatures from across the state in order to qualify for the ballot. More than 10,000 individuals had donated to the ballot committee as of April. The two Republican justices up for re-election this year, Beth Clement and Kurtis Wilder, stayed silent throughout the hearing. The three other Republican justices, Chief Justice Stephen Markman, Brian Zahra and David Viviano, asked vigorous questions of both sides. Markman questioned Crabtree on whether his argument that an initiative is fit for the ballot if it serves a single purpose could be applied so broadly that it would make almost anything changeable through ballot initiative. “The single purpose test is just as open to discretion as any other test that can be applied here,” Markman said. At one point, Markman suggested that the commission created by the ballot petition could circumvent the legislative process to the detriment of Michigan’s citizens. The ballot measure “substitutes 13 citizens chosen at random across the state and interposes that process which now 10 million people have direct representation in,” Markman said. Under the ballot proposal, members of the commission would be randomly chosen — four Democrats, four Republicans and five independents — from a pool of applicants that reflect Michigan’s geographic and demographic makeup. Legislative leaders from both sides would be able to strike up to five applicants each. After Wednesday’s hearing, both legal teams said the justices raised valid questions and expressed hope that deliberations would land favorably on their side. Regardless of what the court decides, there will be political implications. The current system allows whichever political party that controls Lansing to draw the maps. Over recent election cycles in Michigan, that has been Republicans. Republicans largely oppose the redistricting measure — some say it is a Democratic ploy to redistrict in their favor, and most say the state already has systems in place to protect against partisan gerrymandering. Democrats, including all of the party’s gubernatorial candidates, largely support it. Voters Not Politicians maintains that it is not a partisan group and wants to ensure fairness for future elections regardless of which party is in charge, though some organizers from the group have donated to Democratic candidates in the past. Political pressure may also be weighing on some of those behind the bench. Because of a constitutional rule, both justices up for re-election this year (Wilder and Clement) can remain on the ballot and listed as incumbents regardless of whether the state Republican Party continues to support them for the seat. That means that if they were to side with Voters Not Politicians, the biggest political risk they face is losing campaign funding from conservative groups that might otherwise support them, said Lansing political analyst Bill Ballenger. Those might include groups such as the Michigan Chamber of Commerce, which is the largest funder of the challenge group and historically a major donor to Republican judicial candidates, and the state Republican Party itself. Clement, who Gov. Rick Snyder appointed to the court late last year after she served as his chief legal counsel, will be running for the first time and doesn’t carry the statewide name recognition Wilder does, said Ballenger. “Nobody knows who she is. That’s why it hurts not to have any money,” he said. Another political wrinkle: Clement’s campaign treasurer, Mary Doster, is married to one of the opposition group’s leading attorneys, Eric Doster. She disclosed this to Voters Not Politicians’ legal team via email last week. The Supreme Court’s clerk wrote in the email, “Justice Clement does not believe her professional association with Ms. Doster will affect her decision in the case so as to require her voluntary recusal.” After confirming that Clement, her campaign committee and Mary Doster hadn’t given legal advice to Eric Doster, lawyers for Voters Not Politicians said it would not petition to have Clement removed from hearing the case. Katie Fahey, director of Voters Not Politicians, said after the hearing that she’s not regretting that decision. 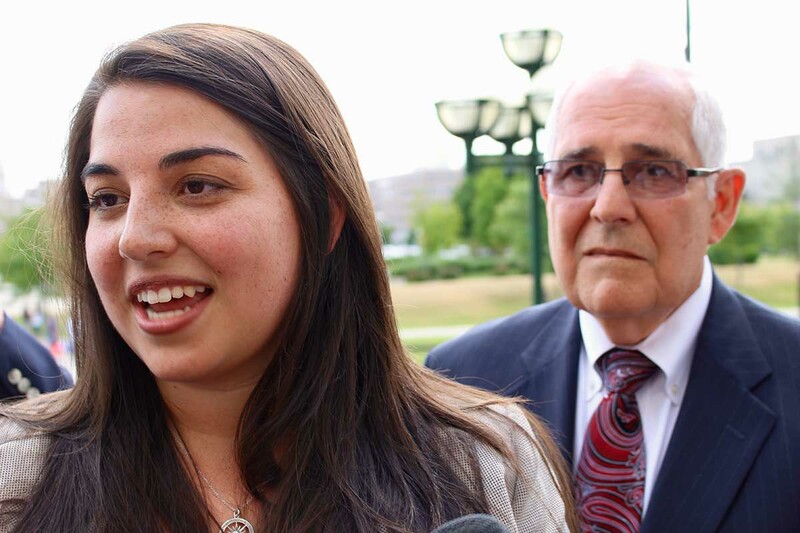 “We believe that they heard the case fairly and we look forward to their decision being issued,” Fahey said. Justin Long, a law professor at Wayne State University who specializes in state constitutional law, said a politically motivated decision is unlikely. Just because justices are nominated by parties doesn’t mean they’ll vote along party lines, Long said. Rather, a party label more often reflects their ideology about how law should be interpreted. “They will naturally tend to read (laws) according to their own ideological preferences, and there’s no way around that,” he said. Very interesting article - decision may hinge on the details of how the commission would be formed. If so, the worst case scenario (court bars the ballot initiative) could lead to delay but a new effort with a revised procedure for forming the commission. This is no easy feat - who guards the guardians? I am very concerned about the 5 "independent" members of the commission. Who names them? Are they truly independent? We would be better off with a computer program. Who programs the program? So you're back at the same place. Michigan's current 1963 constitution created an independent eight-member commission consisting of four representatives from the two major parties. It was charged with drawing congressional and state legislative districts. The commission’s members were to represent four geographical regions: the Upper Peninsula, northern lower Michigan, southeast lower Michigan and southwest lower Michigan. This commission was struck down in 1982 because it was a clear violation of the one man, one US Supreme Court decision. The court decision created a need for a new method to draw legislative districts, and after a convoluted process, it ended up being ssigned to the state legislature, the very body whose members had been barred from serving under the original constitutional language. The current Plaintiff's argument that our current system now allows all Michigan voters to have a voice in how lines are drawn is clearly anemic, and the fact that the drafters of the constitution intended that they have no role shows that it is baseless. Indeed, the fact that Plaintiffs call themselves Citizens Protecting Michigan’s constitution is laughable. The Court of Appeals found Plaintiff’s complaint was “without merit.” There is no reason why the Supreme Court should not reach the same conclusion. This particular aspect is troubling only because we have a Tax Tribunal that is essentially the same type of body which has wrecked economic havoc with their "dark store" policy. The silence from the opposition that has no qualms with that situation is startling. Don't tell me it not the same thing because it's not a constitutional issue. That group has been made untouchable from citizen accountability, and poses a more serious threat. Well considered measures that temper one party dominance of the political process can help alleviate the wildly swinging partisan momentum building in this country. Political gerrymandering like closed primaries is designed to allow a minority to control the political choices of the state as a whole and is opposed by power brokers who don’t represent the wellbeing of the citizens and is anti ethical to truly representative democracy. The citizens of this state have an opportunity to say whether or not one party power politics should dominate through representative manipulation. The Michigan Supreme Court should allow this to go forward.